Students will be able to use coordinating conjunctions to write compound sentences. Write the acronym "FANBOYS" on the board in large letters. Tell students that the word FANBOYS is actually an acronym to help them remember the coordinating conjunctions "for," "and," "nor," "but," "or," "yet," "so." Write each conjunction under the coordinating letter in the acronym. Remind students that conjunctions are "joining words" that help connect phrases or sentences. Provide an example of a conjunction in context like, "I want to go swimming so I can practice the backstroke." 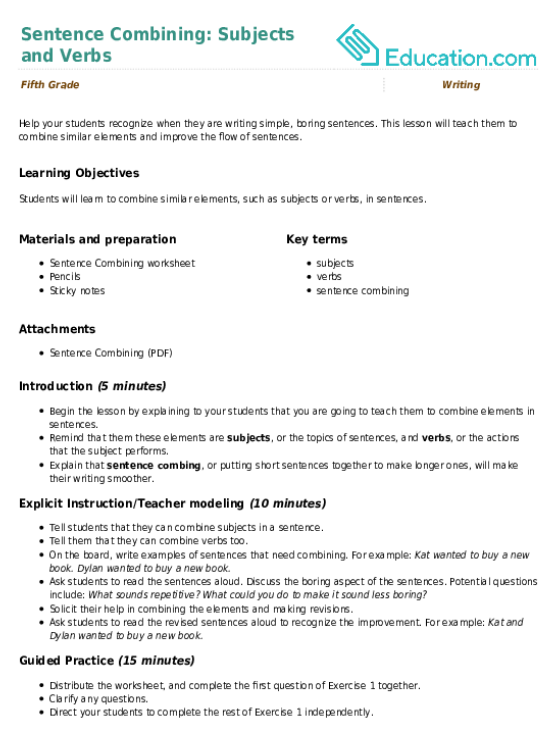 Circle the conjunction in the example. Explain that today we will use conjunctions to write compound sentences. Tell students that a compound sentence is made up of two or more complete thoughts (independent clauses) that are combined using a conjunction and a comma. Write two simple sentences on the board, like: "Grandma makes the best apple pie. She doesn't make blueberry pie." Remind students that a simple sentence (independent clause) contains a subject and a predicate (verb phrase). Label the subject (Grandma/she) and verb (make/makes) in each sentence. Show students how to combine the sentences using a conjunction (i.e., "Grandma makes the best apple pie, but she doesn't make blueberry pie."). 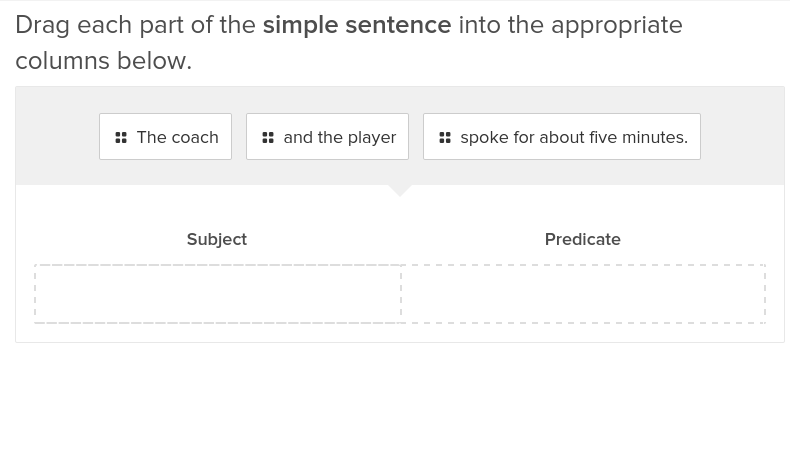 Circle the conjunction in the new compound sentence. Hand out the worksheet Compound Sentence Practice. 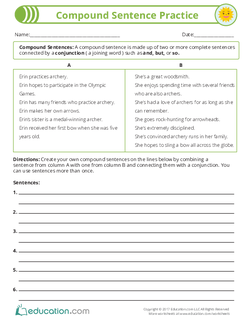 Review the instructions and model the activity by combining two simple sentences to make a compound sentence (i.e., "Erin practices archery, and she enjoys spending time with several friends who are also archers."). 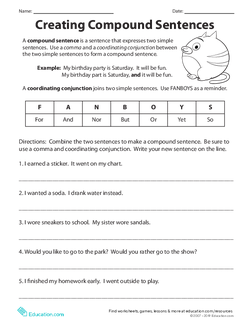 Instruct students to work with a partner to write five additional compound sentences on the worksheet. When all students are finished, call on a few volunteers to share their sentences aloud. Hand out the worksheet Creating Compound Sentences. Review subjects and predicates so that your students are familiar with the basic parts of a sentence (see optional materials). 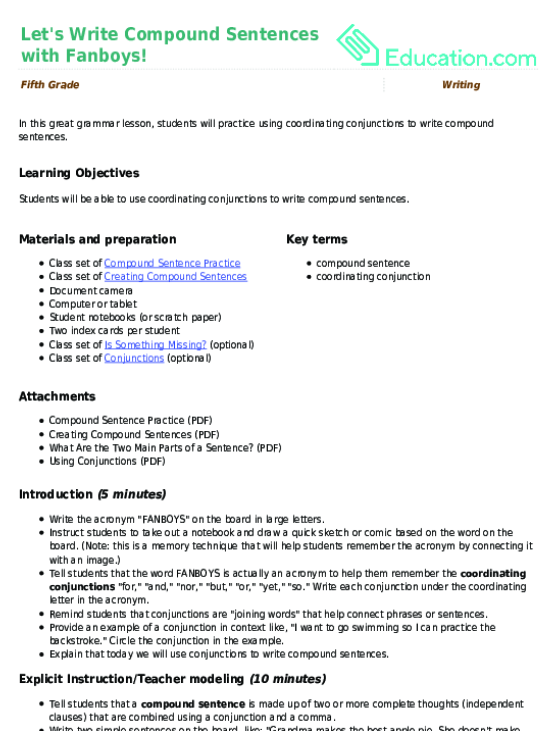 Have students read compound sentences and identify the conjunction that is used (see optional materials). Have students revise a piece of their own writing by combining simple sentences to add interest. Give each student two index cards. Tell students to write a simple sentence on each card about a common topic, like recess (i.e., "I think recess is too short," "I play basketball during recess"). Collect the cards and mix them up. Invite several students to share their sentences with the class. Collect the cards and mix them up again. Repeat the activity several times, using student responses to gauge understanding. 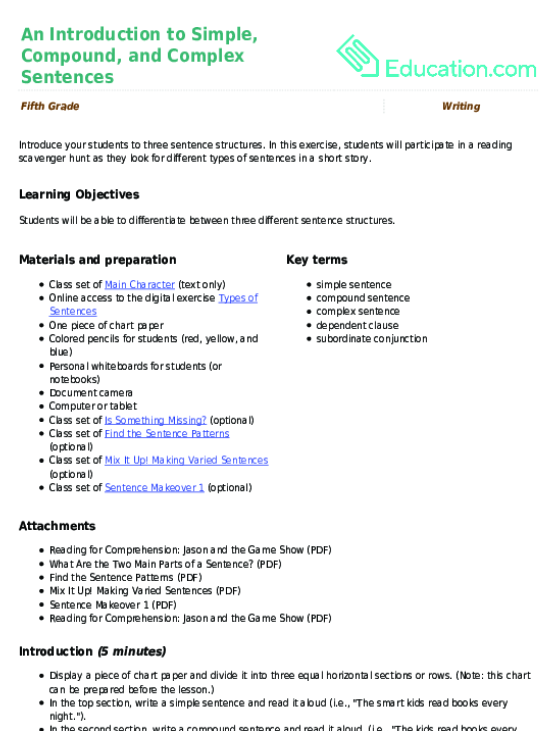 Show a video to review, like "Compound Sentences by Melissa" (see related media). 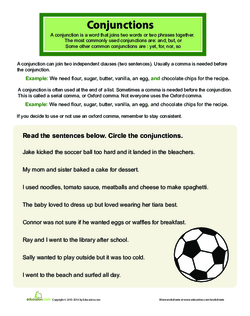 In this great grammar lesson, students will practice using coordinating conjunctions to write compound sentences. In this exercise, students will participate in a reading scavenger hunt as they look for different types of sentences in a short story. Help your students recognize when they are writing simple, boring sentences. This lesson will teach them to combine similar elements and improve the flow of sentences.